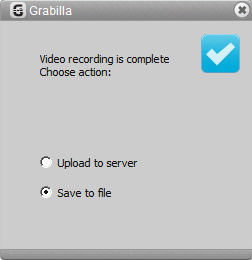 After capturing video or screencast and pressing Stop button you will see simple window with two options: Upload to server or Save to file. You can select Upload to server, wait until your video upload is finished and then you will get a link to page with your video embedded. Like this one. You can send this link to your friends or post it to Facebook, Twitter, or anywhere you want.